In turn, your patient should have an opportunity to ask questions to elicit a better understanding of the treatment or procedure, so that he or she can make an informed decision to proceed or to refuse. The office should document the initial shade score. The initial shade score can help the office, manage patients expectations for initial results, and need for follow up appointments; for more information on this subject please consult your rsw representative or see our section on important whitening facts in this web site. The initial pedicle layer and extrinsic stains should be removed with polishing before the whitening process with gels begins. Do not use pumice because this is not an effective polishing agent. Please use a medium or courser grade polishing paste, fluoride in the paste will not effect the whitening process. Typically good polishing requires adequate polishing paste and about 5 seconds per area on the tooth where you are polishing; resist the temptation to continuously move the polishing head; it is already spinning; you need to let the paste/gel have a chance to work at that specific location. Please don’t forget to polish both the front and back of the anterior teeth. This is the final preparatory procedure before delivery of the gel and tray to the patient. The gingival barrier is placed while a mouth retraction is in position. A cool-dam should be used in combination with a curing light or a cool whitening light. After the gingival barrier is placed paint on the in-office professional whitening gel on the patient`s teeth. This 3 cc syringe has enough gel to perform 3 in-office dental whitenings on your patient. Remember that older patients and patients with gray tones will need multiple appointments, see recommendation on appointments below. Please use the gel on the buccal and the lingual surfaces. Additional gel should be added during the appointment if quantities of the gel is lost. This will require that the office staff member performing the whitening check on the patient and add, but not change out, solution as time goes on. Generally every thirty minutes the patient should be check and additional gel added if needed then initiate that gel with more light. Now you are ready to place the glasses on the patient and position the whitening light; Your assistant at this time is free to leave the operatory as long as the patient has adequate suction and means of contacting the staff if they need something. If you do not have a whitening light in your office, use a curing light for 5 minutes to activate the whitening gel. The ideal whitening process should be 90 minutes. Usually there is a need to add additional whitening gel at the 1 hour mark due to washout of the gel from the tray. The gingival barrier should not be dislodged from its position if adequate space for the barrier was created during the tray preparation phase. Post whitening polishing allows a luster to be placed on the teeth as well as a protective properties that will aide in maintaining results and avoidance of re-staining. 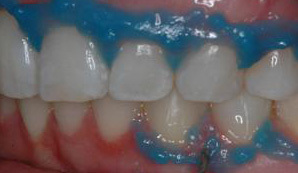 Use a technique similar to the initial polishing technique or simply have the patient brush on the paste and keep in the mouth for 1 minute or longer. The final phase of treatment will be to record the obtained results and to verify if additional take-home or in-office procedures will be necessary. Your take home kit will have vacuum-form trays to make in-office custom trays. Because our system has a high concentration of whitening solution our take-home system include vitamin E to manage unintentional gingival exposure to the whitening gel. Use of our tray system will necessitate the office helping the bite with the first impression. So perform this in-office before the patient leaves the office. 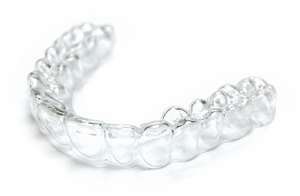 Also be sure to show the patients the upper and lower side of the dual arch tray.